NOGALES, Ariz. — Vice President Mike Pence met with Border Patrol officers in Nogales Thursday, calling on Congress to "do your job." Pence landed in Tucson at Davis-Monthan Air Force Base at around 1:45 p.m., then took a helicopter down to Nogales to tour the southern border. Accompanying him was Arizona Gov. Doug Ducey, Chief of Customs and Border Protection's Tucson Sector Roy Villarreal and Departmnet of Homeland Security Commissioner Robert Perez. The tour focused on Arizona's role in National border security. The vice president heard from Border Patrol about large groups of migrants crossing the border -- especially concerning, with the summer Arizona heat on its way. Pence says the Trump administration is working on providing resources for CBP, including a physical barrier. He says Tucson and Nogales used to be the epicenter for illegal immigration a decade ago, but says border security upgrades -- including barriers -- helped those numbers drop. 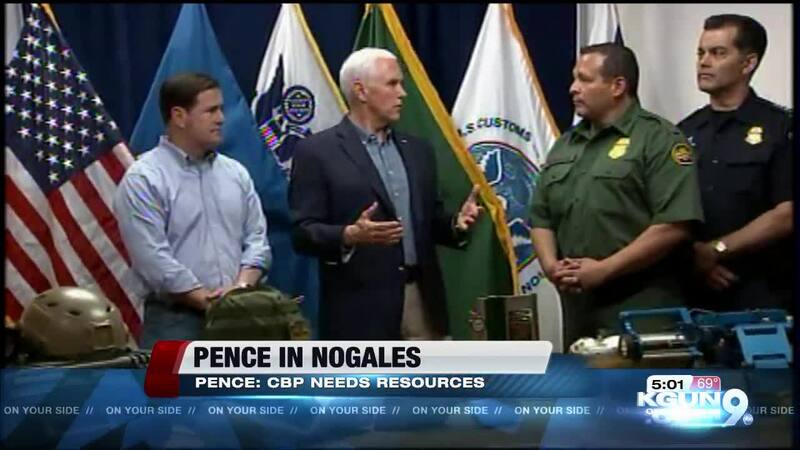 "These families are being exploited by drug cartel and human traffickers, and these organizations, as you said, chief, are exploiting loopholes in our laws," the Vice President said in a meeting in Nogales. Pence says the Trump Administration is calling on Congress to come together to close loopholes in asylum laws, including the catch-and-release system. "We call on Congress today to do your job," Vice President Pence said. "Courageous men and women of our customs and Border Patrol do every day." From Arizona, Pence is heading to Nebraska and Iowa to visit those affected by the season's severe flooding.